Quite simply what it says on the tin – a run through of my personal top 10 songs from the last 12 months. Spanning borders both musically and geographically, this list gives nods to tracks from Eurovision selection shows to proper credible choons that the critics tell us to like. Rules remain the same as previous lists I’ve written and remains at one entry per artist (soz Fall out Boy who released 4 of the best songs of 2018). Have a read and let me know what you think? What songs are at the top of your lists – I’m intrigued! Ok, let’s get this out the way, it does sound a bit like some other famous songs, but Ina Wroldsen’s ‘Strongest’ has a distinct message that really grabs your attention. The crushing emotion of the theme boasts some fantastic lyrics (‘How do you tell a toddler ’bout step-brothers, daddy’s strayed’ / ‘So now you’re gonna be another father? and I will be a different kind of mother’) that flavour the track well enough to dismiss copycat claims. Ina, known as the sixth Saturday, really got things going with this track and fingers crossed it leads to a full length in the new year. There is a degree of nostalgia that helps ranks this track so highly, but finally we received Fergie’s sophomore solo effort ‘Double Dutchess’ this year and with it came this bedmate of the iconic noughties hit ‘Big Girls Don’t Cry’. ‘Save it ‘Til Morning’ is one of the most arresting ballads on the record, complete with a stunning chorus characterised by a distinctive guitar twang. All in all, a winning combination from an underrated record. The stunning standout from their second record proved to any doubters that London Grammar have staying power. ‘Hell to the Liars’ pushes past the usual radio-friendly length to deliver a gorgeous build-up over its six minutes and earns your attention for every record. Hannah Reid’s vocals, if anything, have gone from strength to strength since their debut and tracks like ‘Hell to the Liars’ suggests that this group are continuing their career on a steep upwards trajectory. A well-earned number one here in the UK, Dua Lipa finally achieved the success she deserved in 2018. ‘New Rules’ is an infectious pop gem, we can agree, but the Initial Talk which places it firmly in the 80s is a work of genius. Teamed with the most 80s video you can imagine – somewhere between a workout VHS and a P.E. class – this is one of those rare remixes that ends up being more iconic and addictive than the original – kudos Initial Talk! 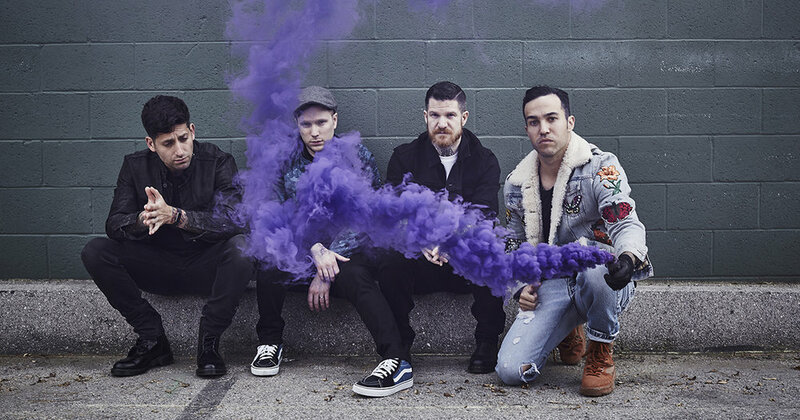 Securing their place as one of the most exciting and vital bands of recent times, Fall Out Boy have been strongly suggesting that their upcoming record ‘M A N I A’ (due January) may even surpass recent masterpieces ‘Save Rock and Roll’ and ‘American Beauty/American Psycho’. Forging together the best of rock, pop and anything else that passes them by, ‘Young and Menace’ is yet another example of the band pushing the boundaries of what we can expect from them. That chaotic refrain is instantly jarring on first listen, but also strangely alluring and ends up luring you back in for repeated listens. Here we are months later and this song still makes little to no sense and I love that. It’s no coincidence that the question of whether extreme metal can become mainstream is being bandied about around the release of Arch Enemy’s ‘Will To Power’. Decades deep into their career, the Swedish-Canadian troupe are achieving even more success with every passing record. ‘The Eagle Flies Alone’ has become a divisive track for their enormous fanbase with some considering it Arch Enemy by-numbers. I, and many others however, see it as a defiant anthem that celebrates a core message in the bands material – a cry for unity amongst the outcasts and misfits forging their own identities. As one of the bands most accessible releases, notching up millions of views already on YouTube, it certainly does suggest that extremity is heading towards the masses. The one to beat that was beaten, Italy’s Eurovision entry this year was sat pretty at the top of betting odds for months until victory was snatched by Portgual. Whilst ‘Occidentali’s Karma’ earned kudos from critics and fans alike thanks to its anthemic refrain and the charismatic Gabbani, unfortunately the Italian delegation fell at the final hurdle, arguably due to the stage performance which was copied and pasted from the San Remo victory. All these matters aside, this track for most Eurovision fans was the soundtrack to the whole pre-season thanks to its hype and captured the essence of Eurovision – slightly kooky euphoric pop with an…erm…dancing gorilla. Whilst it probably won’t be sandwiched between two Eurovision tracks (spoiler alert!! ), this track will surely populate a number of these end-of-year lists. ‘Don’t Delete The Kisses’ saw Wolf Alice go synth-pop…kinda. Starting out as an understated indie slowie, the track takes in a chant-a-long chorus which builds to be underlined by a stunning synth hum that magnified the emotion in Ellie Rowsell’s voice. The frantic way she picks up the pace in her spoken word verses perfectly encapsulates the message of the songs lyrics – the invigorating and often terrifying feeling of falling helplessly in love. Aww.